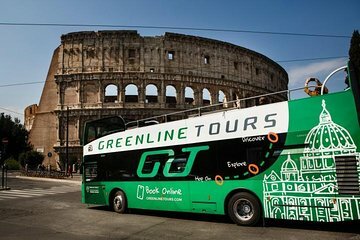 Get to know the Eternal City with a panoramic hop-on hop-off bus tour of Rome. Take in the 360-degree views from the open air top deck of the bus. Ride in comfort past the main attractions in Rome, getting off at any point to explore further on your own. Enjoy unlimited circuits and stops during the ticket's validity. Vlot de bus overal kunnen nemen. Enige nadeel dat je pas een plannetje op de bus krijgt waarop hun exacte stopplaatsen staan. Exactly as described. Buses ran on time and were easy to find. Perfect for an overview of the city that gives you the option of seeing some of the sights in more detail. Some great information with using the headphones but was too busy taking great pictures to pay attention. Great to take a full ride around first and then make your stops on the second go around. With that method you'll know exactly where you'll want to stop and spend more time. Good way to get around and plan sightseeing stops. Suggest you ride full route first and start individual stopping on second time around. Readily available buses to take you to 8 stops along the way in Rome. Great way to see the city without having to walk the entire time. This is a typical HOHO tour. You get a good perspective of what to see in the city. However, Rome is such a crowded city the tour buses are not allowed to stay long in any particular spot. The narration does a passable job in explaining the major attractions. The tour does give you the overall perspective and could help you decide which sites to come back to and spend more time. My biggest complaint is there are many HOHO bus tours in Rome. Signage at the stops is quite limited so it can be very easy to get confused and not know where to get back on your particular tour bus line after you hop-off. Better signage and maps would help but with so many tourist and HOHO bus tours I think the operators see no reason to invest more in signs and maps. A really good way of seeing Rome on our first day and we were able to get a good idea of the geography of the city. Good value for money and a must if visiting Rome for the first time.